While Lost in Space fandom has generated a lot of fan written fiction over the years, only one book of Lost in Space fiction has been issued by a major publisher, Dave Van Arnam and Ron Archer's Lost in Space paperback from 1967. The publication of the book was a direct result of Irwin Allen's desire for a book tie-in for the show. 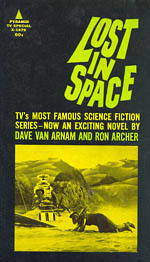 Pyramid Books, a major publisher of Science Fiction in the 60's acquired the rights to the book and asked two up and coming SF writers, Dave Van Arnam and Ted White (Ron Archer was Ted's pseudonym) to collaborate on the project. As things turned out Van Arnam wrote most of the book while White's contribution amounted to little more than an introductory paragraph and proof-reading. The book is not a novel as such but actually a loose set of three joined short stories. For those intimately familiar with the TV series perhaps the most striking thing about the book is its serious straightforward approach. Particularly noteworthy is Van Arnam's book treatment of the Dr. Smith Character. In the book, Smith is a lot smarter and displays little or none of the silliness that crept into the TV series. In a recent interview Van Arnam explained that "I don't like camp ...if I noted that in the series, I disregarded it. It was really a matter of doing a competent, professional job. Ted and I were rather possessive of the SF field, and we get irritated when too many flat-out scientific errors get in the way of a story." Surprisingly the book received only one printing. However, a Mexican edition is believed to have been published in 1969 or 1970. Asked why a sequel to the book never eventuated, the author explained that the publishers were very slow in issuing the first book: "Pyramid took so damned long in publishing it. By the time the book came out, the series was dead meat." With the recent upsurge of interest in Lost in Space, Van Arnam's book is gaining cult status and becoming a much sought after SF collectible. Indeed prices of between $75 to $125 for a book in mint condition is not unheard of.